..my style is changing isn't it - I mean it, I had to stop myself buying a gold tracksuit online. Now, I'm thinking about it, I kind of still want it.. Anyway, I'm really inspired recently by urban culture, skaters, done-but not done.. think sleek, sharp, crisp, bold cuts, shape and texture in clothing right now. 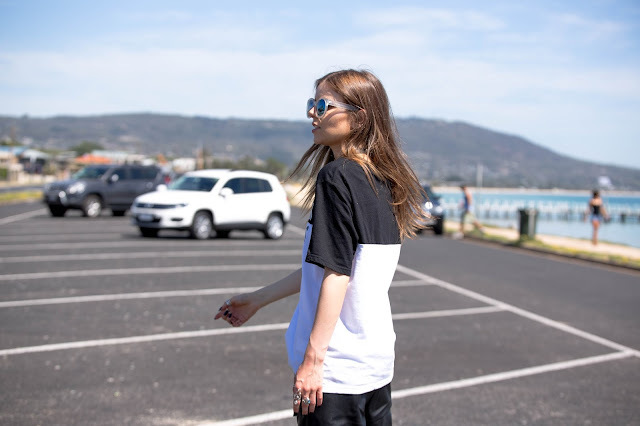 Some of my favourite street style inspiration tends to be very 'WANG' if I do say so myself. It's the whole oversized hoodies, the use of large font and of course black errythangg. With this outfit in particular though I definitely nearly became baked alive! So let me update you.. Australia hits Autumn right and it's like, Oh hi heatwave... I was ready to indulge in denim attire and culottes but no, the weather had other ideas. Hopefully ideas that don't leave me burnt to a crisp again!